(CNSNews.com) -- Since President Barack Obama took office on Jan. 20, 2009, the Environmental Protection Agency (EPA) has issued 3,373 new final regulations, equaling 29,770 pages in the Federal Register and totaling approximately 29,770,000 words, according to a count of the regulations published in the Federal Register. The Gutenberg Bible is only 1,282 pages and 646,128 words. This means the new EPA regulations issued by the Obama Administration contain 23 times as many pages as the Bible and 46 times as many words. The Federal Register publishes documents, including proposed rules, notices, interim rules, corrections, drafts of final rules and final rules. The CNSNews.com tabulation included only final rules from the EPA. CNSNews.com found 3,373 distinct rules published by the EPA since January 20, 2009 covering greenhouse gases, air quality, emissions and hazardous substances, to name a few. The Obama EPA regulations have 27 times as many words as the entire Harry Potter book series, which includes seven books with 1,084,170 words. The EPA regulations have more than double the number of words of the Obamacare regulations, which have 11,588,500 words and are 78 times as many words as the Obamacare law itself, which contains 381,517 words. The EPA regulations, to date, have 6,552 times as many words as the U.S. Constitution, which has 4,543 words, including the signatures; the regs also have 20,418 times as many words as the Declaration of Independence, which has 1,458 words including signatures. Over the course of Obama’s presidency, the EPA has greatly expanded its regulatory overreach. 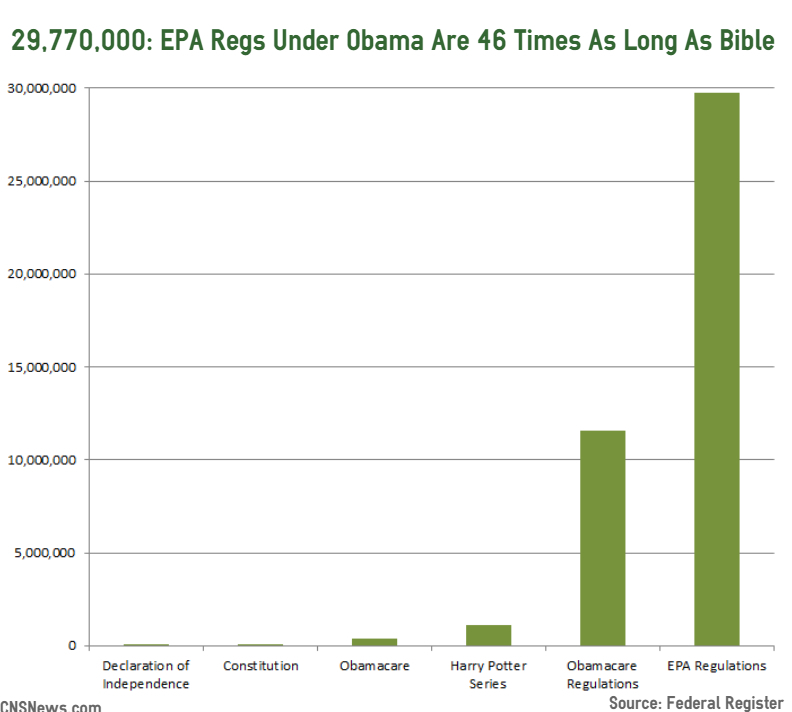 In President Obama’s first year in office in 2009, the EPA issued 365 regulations, averaging one rule per day. In 2010, the EPA issued 454 regulations and in 2011, the EPA issued 557 regulations. 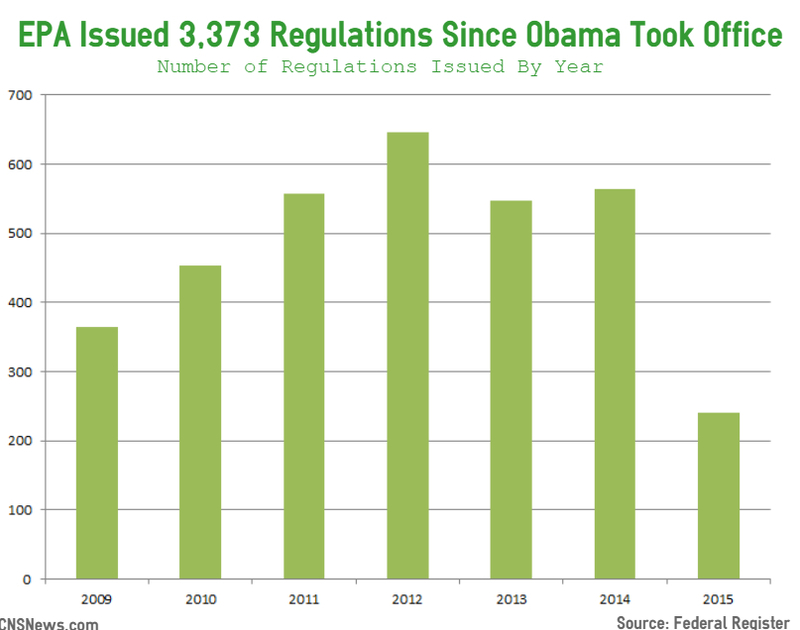 The number of rules issued during the Obama years peaked in 2012 with 646 final rules issued--76.9 percent more than issued in Obama’s first year. In 2013, the EPA issued 548 regulations and in 2014 the EPA issued 564 regulations. So far, in 2015, the EPA has issued 241 regulations. The EPA has issued 3,373 regulations over the 1,665 business days since President Obama took office. This means that the EPA has issued an average of about 2 regulations per work day, Monday through Friday, during Obama's presidency. There have been 2,329 calendar days since Obama has taken office, meaning the EPA has issued an average of about 1.45 regulations per calendar day. To get an approximate word count for the EPA rules in the Federal Register, CNSNews.com evaluated a few random rules from the 3,373 EPA regulations published since Obama took office. In these rules, as published in the Federal Register, each page averaged approximately 1,000 words. From this, CNSNews.com calculated that the 29,770 pages in the 3,373 new final EPA rules issued during the Obama administration equal 29,770,000 words. This is only an approximation because some pages in the Federal Register carry more words than others, and some regulations end in the beginning or middle of a page. For example, one of the regulations was five-pages long and totaled 5,586 words, an average of 1,117 words per page. Another regulation was three-pages long and 3,150 words, which averaged to 1,050 words per page. Another rule was four-pages long and 4,426 words, or an average 1,106 words per page.